There are two man made CASEE ponds on the site that are used by students. The ponds are accessible from the gravel path adjacent to the CASEE greenhouses. Both the large and small ponds are utilized for egg mass surveys by the Biology classes and amphibian surveys by the sophomore classes. The ponds are habitats for salamanders, frogs, macro-invertebrates, birds and mammals on the CASEE campus. 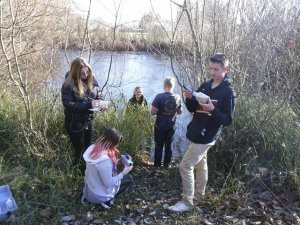 Students conducting water quality analysis at CASEE pond.